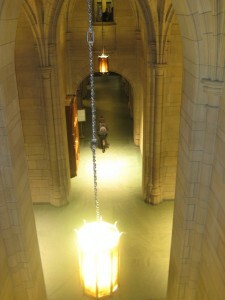 Turns out, the Cathedral of Learning truly is a cathedral. Albeit built in the early 1930s, this building would not be out of place among the Gothic cathedrals of Prague. Or, as the place for Harry Potter and his friends to attend lectures on the secret world of magic potions and sorcery. This 42-story building is the tallest academic building in the western hemisphere. 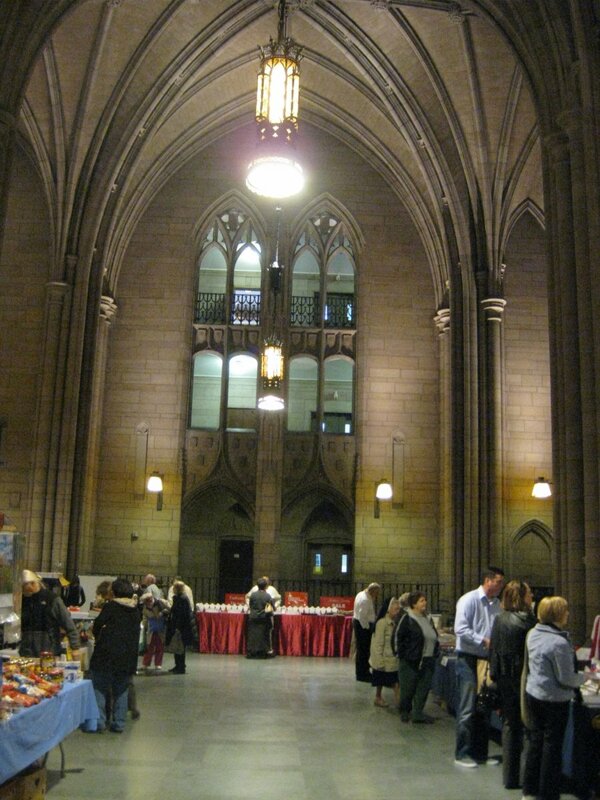 Walk in, and you’ll find yourself in the massive “Commons Room”, 3-stories tall study area built in the Gothic style. Vaulted ceilings, hanging chandeliers, and narrow twisting stone stairs add to the decor. 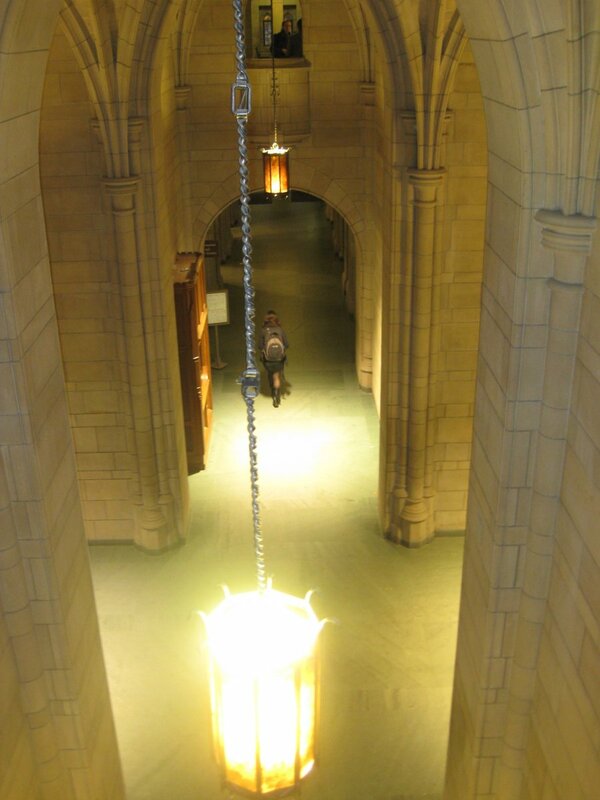 Surrounding this architectural masterpiece are the 27 Nationality Rooms, classrooms beautifully decorated by students in the motives depicting the ethnic groups that helped build the city of Pittsburgh. In the Czechoslovak room students sit on wooden benches carved out of larch (smrekovec, conifer common in the Tatra mountains), and write on a blackboard above which is inscribed the motto of the Czechoslovak Republic (and the anthem of the Velvet Revolution): Pravda Víťazí, The Truth Prevails. And 14 stories above ground is the home of University of Pittsburgh’s Slovak Studies Program. 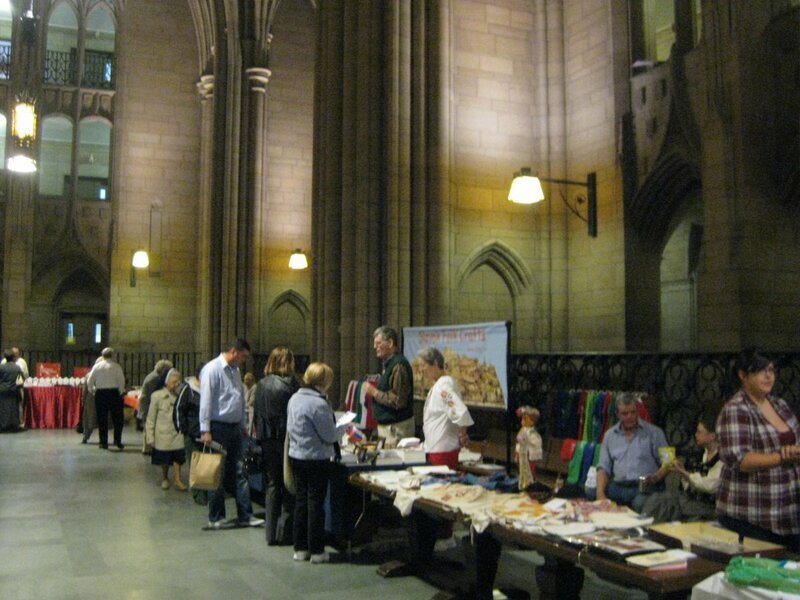 Besides teaching students about Slovak culture and language, Dr. Martin Votruba, Professor of Slovak Studies at UPitt, also helps organize the annual Slovak Heritage Festival. This year marked the 20th anniversary since few students in the Slovak program suggested to the faculty of Slavic Studies that they should organize a festival. In the 20 years since, the festival has grown to be one of the major celebrations of Slovak culture, traditions and heritage in the United States. That’s why I was very happy to be given a chance to participate in it, by offering a cooking lesson in preparing few traditional Slovak dishes. But let’s rewind a bit. The festival took place Sunday, November 7th, just three days after Helene Cincebeaux’s book christening at the Slovak Embassy in Washington, D.C. Saturday around lunch time I got in my car and took off for the five hour journey to Pittsburgh, my first ever. On the way, I passed through the beautiful Cumberland, MD, and then endured about an hour of light blizzard as I crossed the Appalachians on the way to Morgantown, WV. From there it was another hour and half north to the Township of Moon by the Pitt Airport, place where Helene was holding a reunion party for past participants in her Treasures Tours. 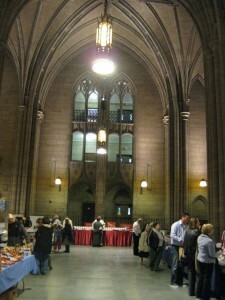 The next morning I headed to downtown Pittsburgh to the festival. 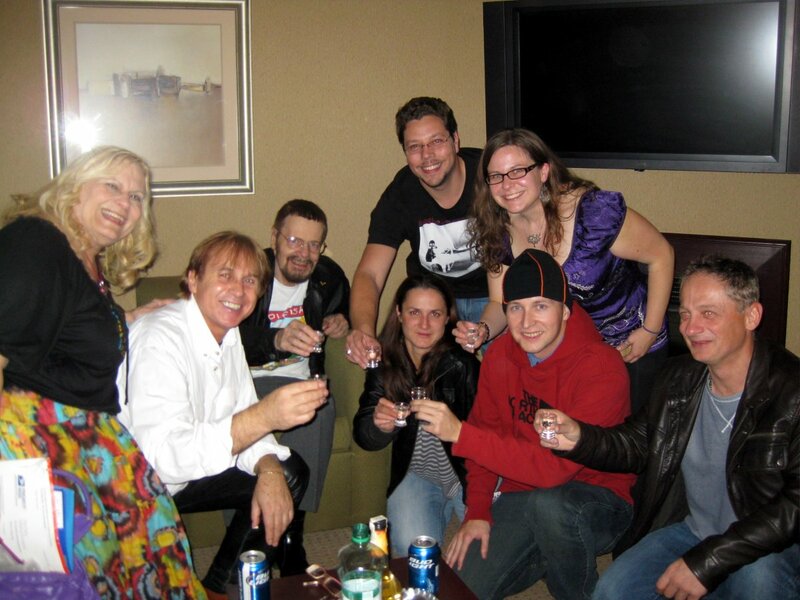 Dr. Votruba took me upstairs, to the 12th floor, where the kitchen that I would be using for my demo was located. I brought up the ingredients, set up few things, and came back down to finish setting up my table. I had just few minutes left before the start of the festivities to walk around the school grounds and snap a photo. The greens behind the cathedral reminded me of the “Drill Field” at my Alma Mater, Virginia Tech. The festival then came into full swing. 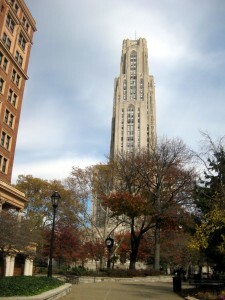 University of Pittsburgh’s Cathedral of Learning. 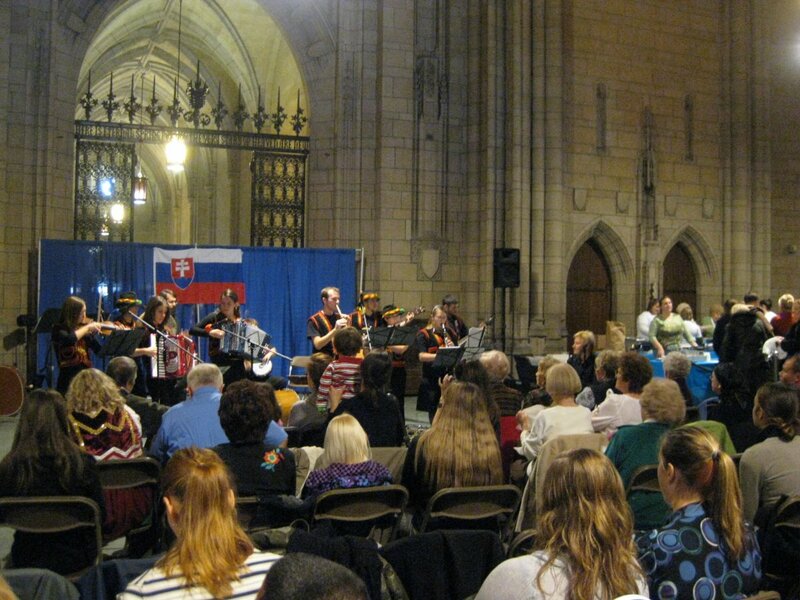 Slovak festival taking place in Cathedral of Learning’s Commons Room. The festival opened at 1pm with Ben Sorensen on the fujara, the traditional Slovak shepherd long pipe. Pitt Carpathian Ensemble came next, and was followed by Slavjane, who also performed in Chicago. They were followed by presentation from the Pittsburgh Area Slovaks, PAS, and then by Helene Cincebeaux and her friend Jozef Ivaška. Lisa Alzo also talked on the theme “Sojourn in Slovakia”, John Righetti gave a talk about “Slovaks and Rusyns: Differences and Similarities.”, and Marcela Michalková talked about “Večerníček, Treasures Lost and Found”. These night time cartoons came on at 7pm and were the last thing I as a kid got to watch before being ushered to bed. Pittsburgh Junior Slovakians and Pittsburgh Slovakians closed the festival. But I didn’t have time to see any of these performances. Many folks stopped by my booth to check out the various trinkets I brought in: Slovak cookbooks, meat and poppy seed grinders, črpák (wooden mug for drinking fermented milk), ježko v klietke (hedgehog in a cage, famous puzzle based on Czech adventure books by Jaroslav Foglar), or to sign up for the Slovak cooking newsletter. And then at 2 I headed upstairs. My plan was to prepare the kitchen and wait for few people to trickle in for the 2:15 lesson. I got off the elevator to a line stretching to the end of the hallway. There must have been at least 50 people waiting. Yikes!! This was definitely a much much larger turnout than Martin or I anticipated. 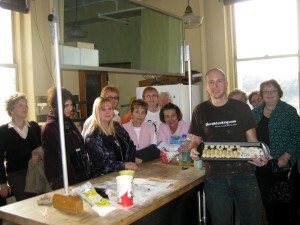 And the kitchen could not hold any more than 20 folks. But we proceeded anyway. I started by preparing kapustnica, the traditional winter sauerkraut soup. Once the soup was cooking, I showed folks how to prepare leavened dough according to my grandma’s “secret” recipe. 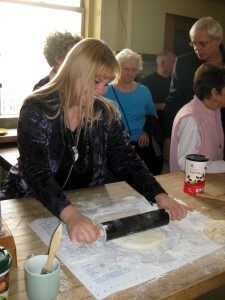 Many people left after the soup making was done, so the second half of the lesson was much more hands-on and personal. 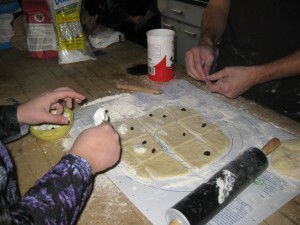 Here we are preparing and rolling out the leavened dough. 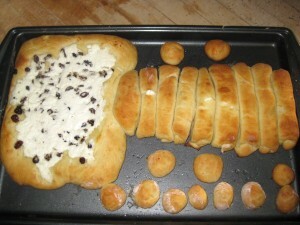 We then filled the buchty with sweet farmer’s cheese, and also prepared bobalky and tvarožník. They turned out beautiful. I hope they tasted good too. Nothing was left by the time I made it back downstairs after cleaning up the kitchen. And few more pictures from the festival, including these beautiful Christmas tree decorations (ornamenty) that were for sale. And a photo with Dr. Votruba at my booth, the man who organized this great festival. 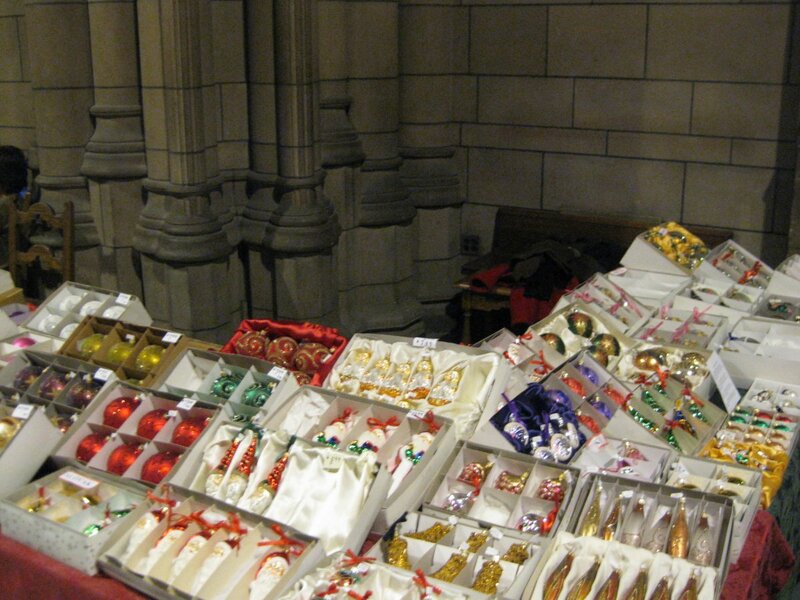 Also a scenic shot from the cathedral. And finally few videos. I had a great time at the festival and definitely plan to come back next year. See you then! Ben and Dr. Q playing the fujara at Helene’s party, and traditional Slovak dancing at the festival. Ben is an American who learned to speak (and sing) Slovak. He can sing Slovak songs better than I! 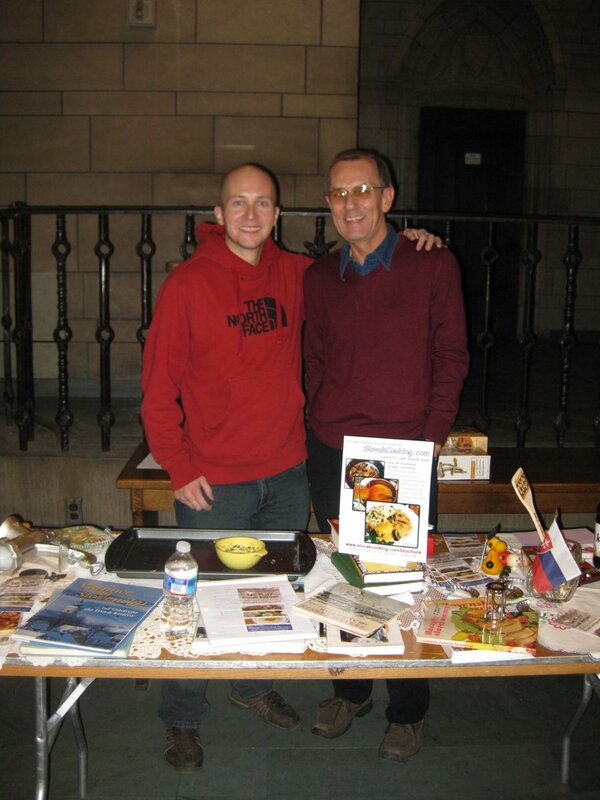 I’m from Pittsburgh, with Great grandparents from czech, but I don’t know that much about the food – I am trying to figure out what wine sausage is and where to find it in the states (or how to make it if it doesn’t involve actually making the sausage itself)… does anyone know? Hi Fred, thank you for answering this! I have never heard of wine sausage, what is it? 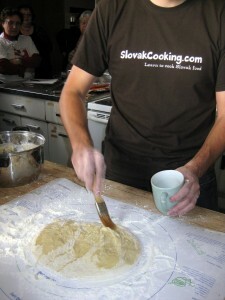 Where can I find the Slovak cooking t shirt?